Anytime Apple does anything, the entire tech world takes notice. The just a few years ago, the company was an also-ran in the computer market, but thanks to the introduction of the iPod, iPhone and iPad, they company has reinvented itself as a maker of user-friendly, high tech gadgetry that also happens to make computers, too. Their latest entry in the “must have” world of gadgets is the Apple Watch, which is scheduled to hit the market this week. At prices ranging from $349 to $17,000, both the technology and watch industries are eagerly watching to see what, exactly, the effect the Apple Watch is going to have on the marketplace. While the Apple watch is expected to sell well, at least in the lower price ranges, it remains to be seen if the Apple Watch is going to revolutionize the market for smart watches. A few companies, such as Suunto, Garmin and Swatch, have had smart watches on the market for some time now, and they haven’t exactly taken the world by storm. They’re favored by athletes and people who frequently work out, but they’re not exactly a fashion statement. They’re also not exactly new. In fact, smart watches have been around for more than thirty years, making the Apple Watch a decidedly late entry to the smart watch market. The Apple Watch isn’t just late to the market in terms of modern smart watches; the Apple Watch is decades late. What came first? Seiko brought an entire line of smart watches to market in the mid-1980s during the first wave of the computer boom. Granted, the ability of a smart watch in the 1980s to do anything particularly useful was pretty limited, given the technological limitations of the time, but the watch industry was still shaking from the transition from mechanical to quartz movements just a decade before and there were many concerns about the ability of the watchmaking industry to remain relevant or even extant in a world that was slowly going high-tech. Who would want a wristwatch in a world where everyone owned computers? In Seiko’s way of thinking, computer owners would, provided that the device was a computer watch. Seiko’s early models included several, such as the D409, which had a miniature keyboard that allowed the wearer to enter data, such as memos. This was a step up from earlier models, such as the Data 2000, which had an external keyboard that was difficult to use and bulky. 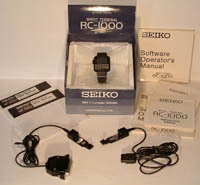 The real revolution, such as it was, came in 1984 with the introduction of the Seiko RC-1000, which could rightly be called the first “computer watch.” The RC-1000 could actually be connected to a personal computer via a serial cable that allowed the user to enter data from their PC. While today, the computer market consists primarily of either Windows or Apple computers, the market in the mid-1980s was much more fragmented. The RC-1000 had to be purchased with a software package for the specific computer system that you owned, which might have included the Apple II, the Commodore 64, the IBM PC, the NEC 8201 or various models from Tandy. In addition to the watch and cable, the RC-1000 packaging included either a data cassette or a 5 1/4″ floppy disk containing the program that allowed the user to connect the watch to their computer. Click here to shop for smart watches at Amazon. The RC-1000 included the basic time, day, date and alarm functions that one would expect from a smart watch, but it also included world time functions, which varied by location and computer system. The watch also had a light, which would allow you to check the time or your data in the dark. The LCD display was quite small by modern standards, and featured two lines of data that was only 12 characters wide. The RC-1000 included a modest 2 kilobytes of RAM. Communicating with the RC-1000 required booting the computer, loading the software, and picking your selection from a menu, whether it be for uploading data to the watch, setting the world time, or scheduling your alarm. Granted, this seems like a rather cumbersome process, but on the other hand, this smart watch was marketed to people who were computer hobbyists who enjoyed working with their computers. Seiko modified the RC-1000 and followed it with a number of somewhat more capable models throughout the rest of the decade. Like most fads, these early smart watches didn’t really catch on. It wasn’t due to poor design, but rather due to their rather limited abilities. This had to do with the fact that high resolution displays were not yet available and the fact that memory was, at the time, still quite expensive. Modern smart watches, such as the Apple Watch, might come with several gigabytes of RAM, which makes them far more capable and useful than the older smart watches from the 1980s. The higher resolution of the Apple Watch screen will also make it more capable in terms of features, as the Apple Watch will be able to display quite a lot of useful information and possibly even images for the wearer. One advantage the older smart watches might have over the Apple Watch is battery life. 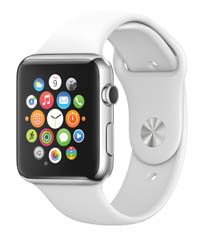 The Apple Watch has a claimed battery life of 18 hours, which isn’t particularly great for electronic timepieces. Most quartz watches can run for a year or two on a single battery that doesn’t need to be recharged. The Apple Watch will require daily recharging. A somewhat overlooked piece of information about the Apple Watch might give many prospective buyers pause, however – the Apple Watch has a significantly shorter battery life if you use it to make phone calls. How much shorter? According to Apple’s own documentation, battery life in the Apple Watch could be less than three hours. This is going to come as quite a shock to anyone who expects, as anyone might, their Apple Watch to run for at least an eight hour day without needing to be recharged. In all likelihood, the Apple Watch is going to be a huge success. Buyers just need to remember that while the Apple Watch may be new, the smart watch isn’t, and Seiko had them on the market 30 years ago.